The Hotel Foresteria is situated at 1 km from Porta a Selci, one of the ancient access gates of Volterra. From this Hotel you can easily reach the historical center, the famous Piazza dei Priori and the most important museums of the city. Volterra is an ancient Etruscan city first, Roman settlement then and active village in the medieval age and is situated in the heart of Tuscany. Thanking to its advantaged position you can easily reach the most famous art cities, as Florence, Siena, San Gimignano, Pisa. Volterra towers above the Cecina and Era Valley and is an ideal starting point for many different horse or walk trekking as bike tours. For the see lovers there is the possibility to reach the beach in half-an-hour and visit the Costa degli Etruschi. 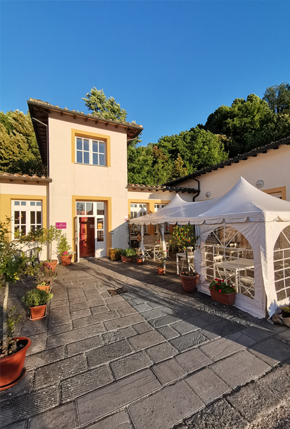 The Hotel La Foresteria, overlooking the typical Tuscan landscape, that you can admire from all the bedrooms, offers to all its guests a pleasant stay in comfortable rooms furnished with modern, functional style and without architectural feature that denies access to the handicapped. It is an ideal location for people who loves quietness and relax, who would really take a break from the everyday stressed life! In our Hotel you will find the bar, the restaurant, the TV room, the reading room, a beautiful outside area with tables, chairs and sun umbrellas and a private wide parking place for your cars, absolutely free of charge. In the TV and the reading rooms WI-FI is provided. Staying at Hotel Foresteria you will enjoy a familiar atmosphere, appreciate our hospitality and taste our good Tuscan kitchen!